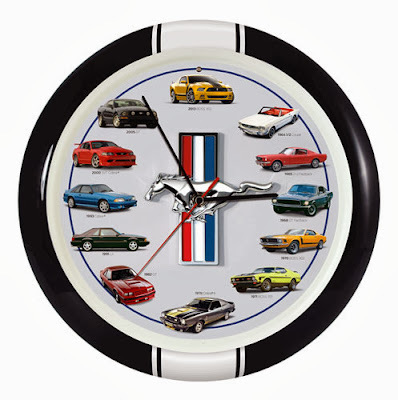 History of the Mustang Sound Wall Clock. This is really a cool clock that just arrived. It features a bright black frame with a white racing stripe. The clock measures 13 inches in diameter. As you can see in the picture, different model Mustangs from the original 1965 to the current models are featured on each hour. The coolest feature is the fact that an authentic engine recording of each of the various models sounds at each hour! Hear a sample by clicking here!!! Pretty neat, huh? Oh, there is also a light sensor built in that turns the sound off when the room is dark.